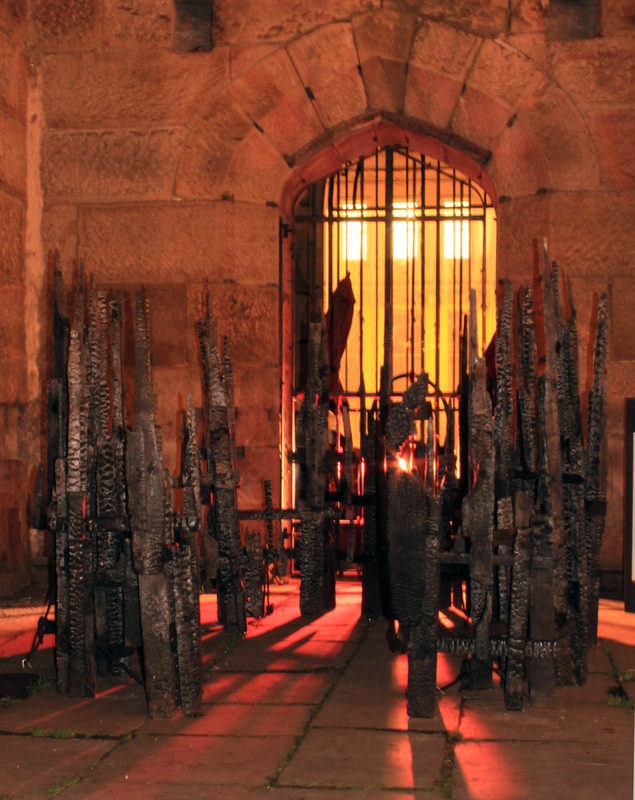 St Luke’s, or the bombed out church as we all know and love it, is currently hosting Unterschlupf, an exhibition by Pamela Sullivan and Carol Ramsay of Arena Studio and Gallery. If you’re having a wander around Bold Street, just go a little further and take some time to see this really rather wonderful work. I went on a cold October tea time, wrapped up in my very best woollies and it was well worth the visit. Carolyn Shepherd’s burnt wooden structure near the church’s entrance sets the scene for a war-torn Liverpool, which is also depicted as you wander around the grounds with images, including a particularly dramatic one of the Victoria Monument surrounded by the blasted rubble of the surrounding buildings. But don’t make the mistake of thinking this is something gloomy. Oh no. As I approached the main exhibit, my new young mate Flynn (great name!) was banging out a tune reminiscent of church bells on an instrument made up of that most prosaic of things, old car wheels. Flynn bashed away making a tune that echoed the dramatic organ music being played. Untershlupf itself consists of Aus De Asche by Pam Sullivan and Behuten by Carol Ramsay. One of the things I really love about these artists is their ability to take the most ordinary of items and turn it into something beautiful. 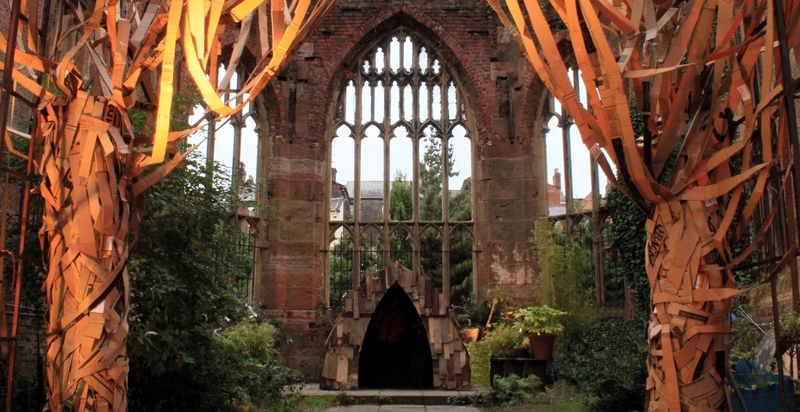 Aus De Asche is a pair of trees made from strips of recycled cardboard which tower over the remains of St Luke’s altar. Up close you see staples and addresses for depots in Bradford, but stand back and it’s a thing to behold. Time and the cold and wet weather can only cause these structures to start to fall apart and I’ll be interested to see how it ends up by the end of the exhibition. Behuten is made from recycled wood – even old toothpicks put in an appearance – and brings to mind an old Anderson shelter, sits on the old altar; its shape reflecting the gothic window above it. Go inside and written all over the walls are stories from people remembering the war. There’s the story of one family who had to leave their home when it was infested with cockroaches, only for it to be destroyed by a bomb as they walked away. 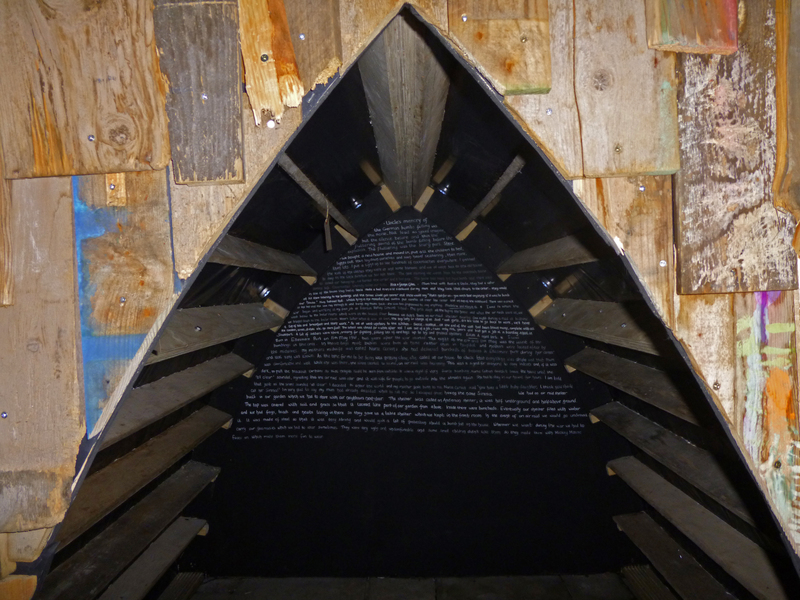 The stories are being added to all the time, so see what new ones are there if you pop along. Unterschlupf is at ST Luke’s Church until 28th October, 1pm to 5pm.